Period Tents is a company situated on the edge of Sherwood Forest in Nottinghamshire, England. 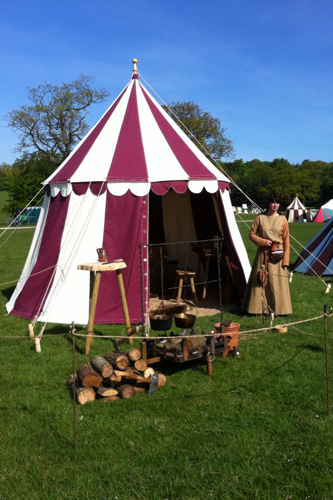 We make medieval & period tents for the re-enactor and general public. We only use the finest quality materials - 12oz or 14oz canvas, rot and water-proofed. Fire-retardant canvas is also available. All woodwork is ash and our pegs are hand-cleft ash. Among our products we make pavilions, burgundians, campaign tents, wedge tents, bell tents and awnings, to name but a few. We also offer a bespoke service for our customers. We ship our historic tents all over the world. We currently have clients in Belgium, France, Germany, Holland, Ireland, Italy & Portugal, as well as our many UK clients. Alison and Pete will be delighted to hear from anyone with a requirement for a tent, a repair or anything else tent related - we offer a complete service. We make the frame to your requirements and design and manufacture the canvas in the colours you choose, giving you the choice of fire retardant fabric if you need it. We offer a free 12 month guarantee on all tents we manufacture.